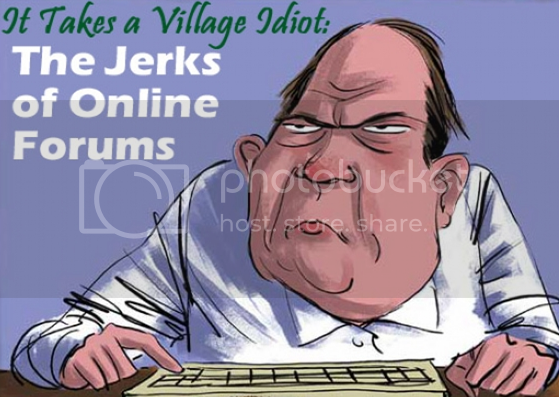 Thread: Which one of these forum jerks is you ? IF at all you could classify as one, which one of these would resemble you? I know none of these are you even I don't consider myself to be a jerk but just this once lets chill and take a pick! Visit PCWorld and check out - which one of these comes closest to you? Or IF you had to be a jerk, which one on these could be you? Could I be the "The FIRST! Guy" ?? I am either the peacekeeper or the smartypants. Of course, it depends on the forum and the OP. Sometimes, I can be a real jerk online, if it calls for it. But, I visit a wide range of forums. Most of the time I am pretty civil, especially when I am in a help forum. In an opinionated forum, though, I'll speak my honest opinion and views (and defend them, if necessary). At one time or another i have been all of the above. Not sure where I stand now. Mostly a 'Lurker'.